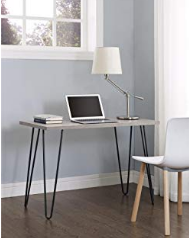 Maybe you are living in a small apartment or in a small house and there is no particular room for office work or study. Maybe your children and you are doing the study and other related tasks on the couch, bed or even on the dining table. Not only this looks awkward but also makes the performer tired and irritated. In order to perform any kind of task, concentration is very much important and you should enable all the arrangements so that your concentration cannot get interrupted by anything. If you have no big space to place a table and chair and do the required task, just install small desks smartly. It will satisfy your requirements without wasting a lot of space. 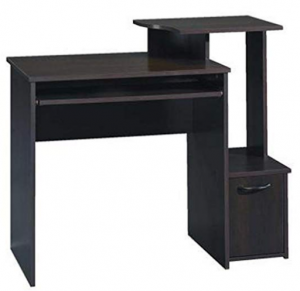 When it comes to choosing the best small desk for home or office, people find themselves in great confusion. If the requirement is limited to getting an ideal small desk, you need not to hire an interior decorator at all. This guide will help you to get the best one. when you are already sacrificing the size, you should look after on other aspects such as storage drawers, shelf or wall, and material. It looks really classy and perfect for the office or home usage. It has space for a monitor, designated shelf, slide out keyboard tray, and space for CPU. To keep the important document secure there is a storage compartment. It is of particle board and has a cinnamon cherry finish. The length is over 39 inches and just perfect for small spaces. 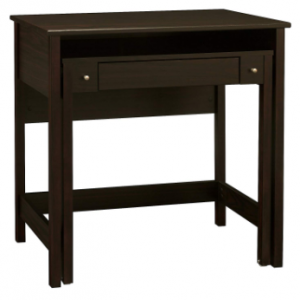 This sleek desk is perfect for the bedroom or living room. And the table top perfectly sits on four hairpin legs. It looks trendy and of 40inches long. It will not take a bid space. You can place it easily at any corner of the room or just next to your bed. It is made up of real beech wood and has a natural smooth finish. It is 40 inches wide, 20 inches deep, and 30 inches tall. You can easily fold it up to save more space. On the top, there is enough space for a monitor and extra office material. It comes almost assembled- just fix the screws and enjoy the benefits. 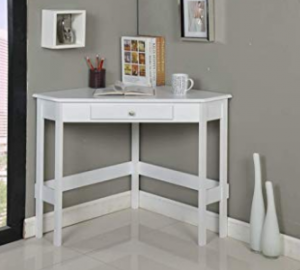 This compact desk looks really great in a living or bedroom. There are numbers of divided slats, shelf on the back, enough space to place the monitor. In the front drawers, you can store important stuff. There is also a hole to pass the cords and keep the space mess-free. Its white oak and ivory color combination looks really great in office interior. 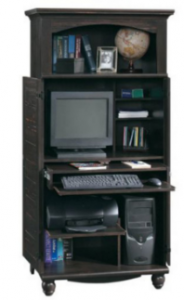 This is a great space saver computer desk; you can easily tuck the computer desk when you are not using it. Here you are actually enjoying two workspaces. There is one drawer to keep some important stuff. You can hang it on your favorite wall and stick to the position. Here you can fix the height by your own. There are a lot of color variations and you can match your room wall color. 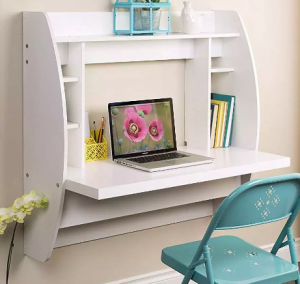 It can carry up to 100-pound weight and there is one cord hole to pass the computer cords and keep the space mess-free. You know that placing the desk at the corner ultimately saves a great space and adds value to the décor. You can place it at nearly all the corners yet work smoothly. It is wide enough to hold a monitor or laptop along with other small stuff. It is durable and a classy vibe to any kind of home or office setting. For very small to no space, it is a perfect choice. You cannot place here any PC but you can place your laptop and can do the needful. You can fold in during work and fold back when you are not using it. Its sleek design provides you the ample space so that you can move freely. After folding back, it looks like a cabinet and adds an appeal to your décor. 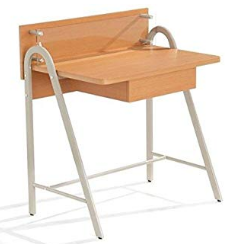 With this kind of desk, you can enjoy both sitting and standing work. We often feel pain in the back due to long time sitting. 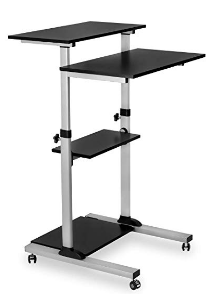 With the help of this desk, you can enjoy standing work too. It does not take a lot of spaces. At a corner, you can easily install it. 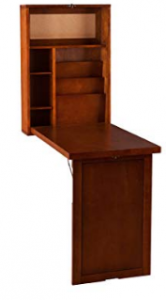 This armoire is a great desk option available today. Here you can securely keep all the important stuff as here you will get lots of shelves and storages. It has an impressive antiqued look. And along with the rustic décor setting, it looks perfect. It is of only 33.7inches and requires a very small place to get installed. It is of real wood, durable, and weighs 152 pounds. 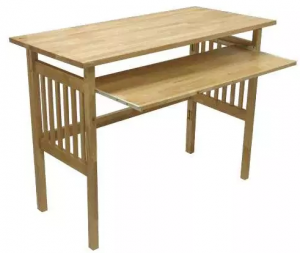 So, if it comes to pick up the best one among these ten options, I will go with Bush Furniture Brandywine Pull Out Computer Desk. First of all, it is within my budget. It looks perfect with my décor and does not take too many spaces. It has a standard height and I do not feel any kind of problem when I seat in front of it. I can easily place monitor over the surface and other small stuff. It is easy to move and there is one drawer to store important documents. Here the cod hole is missing but I can easily pass the cords behind the monitor and keep the place mess-free.